Where's the debris for transiting planets? For many exoplanet systems that have been discovered by the radial velocity method, astronomers have found excess emission in the infrared portion of the spectrum. This has generally been interpreted as remnants of a disk or collection of objects similar to our own Kupier belt, a ring of icy bodies beyond the orbit of Pluto. But as Kepler and other exoplanet finding missions rake in the candidates though transits of the parent star, astronomers began noticing something unusual: None of the exoplanet systems discovered through this method were known to have debris disks. Was this an odd selection effect, perhaps induced by the fact that transiting planets often orbit close to their parent stars, making them more likely to pass along the line of sight which could in turn, betray different formation scenarios? Or were astronomers simply not looking hard enough? A recent paper by astronomers at the Astrophysikalisches Institut in Germany attempts to answer that question. In order to do so, the team compared the (at the time) 93 known transiting exoplanets to stars for which archival data was available through infrared missions such has IRAS, ISO, AKARI, and WISE. The team then searched the data looking for a previously unrecognized bump in the emission in the infrared. Many of the stars they searched were faint, due to distance, so most of the IR telescopes did not have images with sufficient depth to draw much in the way of conclusions. Between IRAS, ISO, Spitzer, and AKARI, the team was only able to examine three stars, and all of those came from Spitzer observations. The most plentiful return came from the WISE telescope which had 53 entries that overlapped with known transiting systems, one of which was excluded due to image defects. From these 52 candidates, the team found four that may have contained excess emission. To follow up, the team added observations from other observatories that lied in the near infrared (the 2MASS survey) and the visual portion of the spectrum. This allowed them to build a more complete picture of the brightness of the stars at various wavelengths which would make the excess stand out even more. While all four systems deviated from an ideal blackbody in the portion of the spectrum expected for a debris disk, only two of them, TrES-2, and XO-5, did so in a manner that did so in a statistically significant manner. While this study shows that debris disks are possible around transiting stars, it was only able to confirm their presence in two stars out of 52, or just under 4% of their sample. But how does that compare to systems discovered by other methods? 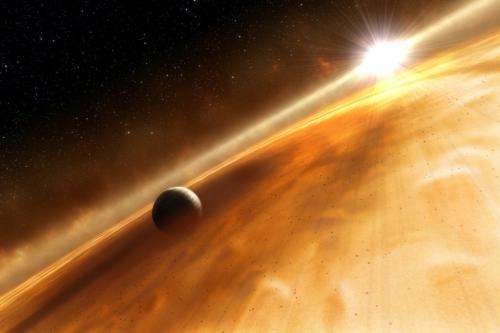 One of the studies cited in the paper used a similar method of comparing archival data from IR observatories to known exoplanet system discovered by other methods in 2009. In this study, the team found debris disks around 10 of the 150 planet-bearing stars, which is roughly 7%. Due to the low return rate on both of these studies, the inherent uncertainty puts these two figures within a plausible range of one another, but certainly, more studies will be in order in the future. They will help astronomers determine just what difference exists, if any, as well as giving more insight into how planetary system form and evolve. Due to the low return rate on both of these studies, the inherent uncertainty puts these two figures within a plausible range of one another, but certainly, more studies will be in order in the future. 52 stars is about 0.000000017% of the ~300B stars in our galaxy. 150 stars is about 0.00000005%. That's a sample size that certainly doesn't warrant such a speculative title. "Where's the debris for transiting planets?" Well, we really have only *just* started looking, but so far it looks to be just where we expect it to be.